It was nearly 2 a.m. at Wrigley Field; Friday's Pearl Jam show in Chicago had now stretched into Saturday and frontman Eddie Vedder was fully prepared to keep going. "We have five minutes left," he told the capacity crowd gathered for the band’s first-ever gig at the baseball stadium. "But we don't want to mess it up in case we ever want to play here again." No one complained: It had been a marathon of an evening – even by Pearl Jam standards. Seven songs into the show, fans were evacuated from the main floor and endured a two-hour rain delay before being allowed to return to their seats in time to watch the Seattle musicians rock well into the early-morning hours. The Wrigley show was one of only a handful for Pearl Jam this summer. (Earlier this month, the band announced a full-fledged fall tour that kicks off in Pittsburgh on October 11th.) 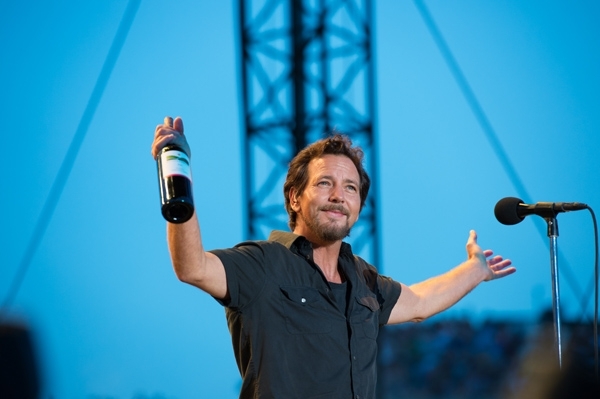 But those familiar with Vedder's hometown affection for Chicago – and more specifically, the Chicago Cubs – had reason to believe this gig in particular would be nothing short of epic. Despite the weather's temporary disruption, the band didn't disappoint: Pearl Jam took the opportunity to not only dish out a heavy helping of their live staples on Friday ("Release," Corduroy," "Black"), but they also mixed in setlist rarities and even unveiled a trio of new songs off their forthcoming new album, Lightning Bolt (due on October 15th). Two of the new tracks – "Mind Your Manners" and "Lightning Bolt" – came in rapid succession shortly after Pearl Jam reclaimed the stage post rain-delay. "Mind Your Manners," a Ramones-esque punk riot released last week, saw Vedder crouched low, whipping his mike stand back and forth as drummer Matt Cameron fired away steps behind him. "Lightning Bolt," a four-four rocker which Vedder introduced as "Lightning," made its live debut on Friday, and spills a tale of a witchy woman ("she comes on like a storm"); it also features a characteristically soaring solo courtesy of guitarist Mike McCready. Later in the evening, the band kicked off their seven-song encore with another new cut, the slow-burning acoustic charmer "Future Days," complete with keyboard accompaniment from Lightning Bolt-producer and longtime Pearl Jam studio wizard, Brendan O'Brien. The evening also provided Vedder a chance to let loose, both literally (during "Porch" he briefly crowdsurfed before swinging from a green light truss) and figuratively. Not surprisingly, he basked in the glow of playing at the home of his favorite baseball team. "It's one of those shows that seems like I've been kind of waiting a lifetime for," Vedder said early on, adding that Wrigley Field, in his estimation is, as far as venues go, "the crown jewel of Planet Earth." To further pay homage to his beloved Cubs, Vedder kicked off PJ’s post-rain-delay set by singing his self-penned Cubbies anthem, "All The Way," after which he was joined onstage by the team’s most iconic player, Ernie Banks. "With all due respect to the gentleman who plays here tomorrow," Vedder said minutes before the rain delay, and referencing country singer Jason Aldean who plays Wrigley on Saturday night, "they're going to have to kick us off the stage tonight." Five hours, twenty-plus songs and a torrential downpour later, Pearl Jam finally decided it was acceptable to call it a night.